Rust—iron oxide—is a poor conductor of electricity, which is why an electronic device with a rusted battery usually won't work. But electrons do move through iron oxide—on seemingly geologic timescales. Now, scientists explain how electrons do this and provide the strongest evidence yet for the leading theory of such movement, a type of semiconduction. 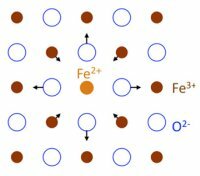 Published in Science, the work forms a new foundation for understanding how iron oxide cycles through the earth. Most iron oxide is in the form of rocks and minerals. Rocks grow and disintegrate via electrons, which control whether passing iron atoms stick and build up the surface or internal ones fall off and break the surface down. What happens depends in part on how fast electrons move through the minerals, something scientists haven't really been able to measure because iron oxide is not a good electrical conductor—extra electrons are tightly trapped in the solid, hardly allowed to move. The scientists, led by geochemists Dr. Kevin Rosso at Pacific Northwest National Lab and Dr. Ben Gilbert at Berkeley National Lab, explored electrons moving through nanoparticles of iron oxide in various mineral forms such as hematite and maghemite. The work showed the electrons reside in divots called polarons—a little distortion in the otherwise uniform lattice framework caused by the electron's negative charge. And they hop from one divot to the next when they get hot enough, taking anywhere from one to five hops per nanosecond through the iron oxide. Researchers performed theoretical work at EMSL that showed how the polaron model faithfully reproduced the experimental data collected at Berkeley Lab. Read the entire news release from Berkeley National Lab. Sponsors: This work was supported by the Chemical Imaging program of the U.S. Department of Energy, Office of Science, and Office of Basic Energy. Additional support was provided by DOE's Basic Energy Sciences Geosciences program to PNNL and the Danish Council for Independent Research. User Facility: EMSL, Argonne Center for Nanoscale Materials, and Advanced Photon Source. Research Team: Jordan E. Katz at Lawrence Berkeley National Laboratory and University of California, Berkeley; Xiaoyi Zhang, Klaus Attenkofer, Karena W. Chapman at Argonne National Laboratory; Cathrine Frandsen at University of Denmark, Piotr Zarzycki at Polish Academy of Sciences and Pacific Northwest National Laboratory; Kevin M. Rosso at Pacific Northwest National Laboratory; Roger W. Falcone at University of California, Berkeley, Glenn A. Waychunas and Benjamin Gilbert at Lawrence Berkeley National Laboratory. Reference: JE Katz, X Zhang, K Attenkofer, KW Chapman, C Frandsen, P Zarzycki, KM Rosso, RW Falcone, GA Waychunas, and B Gilbert. 2012. "Electron Small Polarons and Their Mobility in Iron (Oxyhydr)oxide Nanoparticles." Science 337(6099):1200-1203. DOI:10.1126/science.1223598.